Electrical appliances in bathrooms have special safety regulations. We have created this page to give you some simple guidance in choosing appropriate lighting and heating that will satisfy these regulations. Electrical equipment in bathrooms must be protected against ingress of water. The I.E.E. Wiring regulations (BS 7671: 2001 Section 601) has mandatory requirements for areas containing a bath or shower. These safety standards are measured in zones, with the requirements for each zone being based on the perceived degree of risk of electric shock. There are four precisely dimensioned zones: 0, 1, 2 and 3. It is important to understand the rating by which bathroom lighting and heating is classified. IP rating stands for ‘Ingress Protection’ and is followed by two characters. The first specifies the degree of protection against particles or solid objects. The second specifies the degree of protection against liquids. The interior of the bath or shower which can hold water. Any fittings used here must be SELV (max. 12V) and be rated IPX7 (protected against immersion in water). 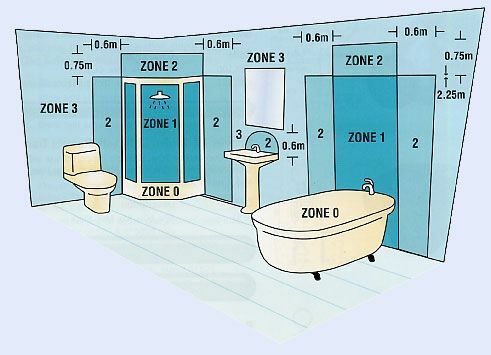 In zones 1, 2 & 3, if there’s a likelihood of water jets being used for cleaning purposes, a min. of IPX5 is required. Where ceiling heights exceed 2.25m, the zones are effectively up to 3m - beyond 3m, the walls are out of scope. Basins are not covered, however they are usually considered to be zone 2. Providing the space under the bath cannot be accessed without using tools to gain access, that space is considered to be out of zone. However, if in any doubt please check.